With professional office organizers, you can transform your business in a way that you never thought was possible. Admit it. It’s hard to run a successful business in today’s day and age. You have to squeeze every possible drop of profit out of every single dollar that comes through the door. You have to do this day in and day out – and it’s exhausting – especially when you are not as organized as you could be. 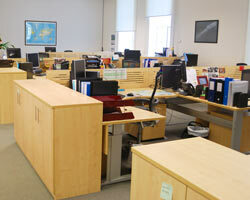 You need an office that is well-organized so that you have a smooth operation. Only then can you make the most of your materials, resources, employees’ time and your physical workspace each day. “Rob Mizrahi and Chaos Commandos are professionals at de-cluttering, re-organizing and setting up new systems to keep your home or workspace organized. Rob helped me organize my home office after years of accumulated stuff, especially paper. The result was smart solutions that led to more space than I ever imagined. We are able to evaluate your workflow as it is right now and then creatively make adjustments that will drastically enhance your productivity. It’s important to have workflow that is customized to who you are. The organization that we put into place won’t last long if it doesn’t match your personality. This is why we take the time to make the evaluations so that you have a customized solution. Less mess is a good thing no matter what industry you are in. When you have less clutter and more organization, it can shine through in many aspects of your operation. You will have less duplications of effort, less leakage, less missing paperwork and lower overheads. When you are more organized, it can also be a significant morale booster – which is always a good thing. Your suppliers, your customers and your employees are likely to take note of the changes when you are more organized. You may find yourself paying bills faster, getting back to customers faster and being able to offer employees the sounding board they need – all because you have put the joys back into being a business owner. There’s no office that is too small or too large for us to handle. When you conquer clutter in a medical office, you can boost your bottom line. You have two businesses when you operate a medical office, which is its own unique challenge. You have an office responsible for filing, billing and scheduling as well as a healthcare facility. Are you balancing the two effectively? When patient’s medical records aren’t where they are supposed to be, it can lead to a number of problems. We will help you streamline the process so you can keep inventory, records and billing procedures up to date and organized. It will allow you to process insurance forms on time and accurately. It will also ensure you have the medical supplies on hand at all times to treat patients. Chaos Commandos gets down to the heartbeat of every industry. Logistics is the major component in keeping your business functioning properly. We can manage your workflow, maintain confidentiality issues and even organize the data you have inside of your computers. 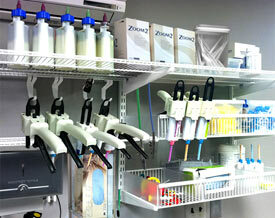 Our goal is always to offer you well-organized space that will produce a more efficient operation for you. This is an investment into the future successes of your business. We are able to take your average office space and transform it into something extraordinary. By utilizing all of the space around you, our professional office organizers will be able to provide you with more storage solutions and more organization. Depending upon your business and what’s causing the chaos, we can think outside of the box to provide you with a creative solution. Our goal is always to improve your efficiency and make a neat presentation to your clients and staff. 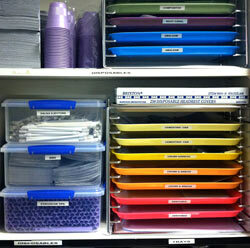 We may use color-coded bins for supply storage. We may create a shelving system in your closet for inventory. We may even be able to offer new data storage solutions so you can always find the file you are looking for without spending too long in front of the computer. You need an office organizer to make sense of the problem. You may be too deep into the clutter to even be able to think straight, let alone think of a solution that will work. Allow Chaos Commandos to come into your office to start making sense of it all. Even when there is not enough workspace for you to work comfortably, we are able to provide you with that space. We have transformed closets into workspaces and utilized spaces high and low to offer businesses the space they need in order to function properly. If you cannot find what you need because of a chaotic office, it’s time to seek help. We have been in the industry for many years and are able to work with everything. There is no mess that we are unable to work with. Even if you think we haven’t seen anything as bad as what you have in your office, think again. When you are tired of not being able to find things and it’s beginning to affect the operation of your business, it’s time to reach out to an office organizing service. We are the professional office organizers that you need, able to transform your chaotic office into something amazing. It’s important for your office to be a reflection of you and what you do. If you want to wow your employees and your clients alike, you need to invest in structure for your office. Whether your office is located in your home or in a Fortune 500 company, we are able to help you. Throughout the metropolitan NYC area, we have transformed offices to streamlined operations and we can do the same for you.